One lunchtime in the early 1970s I sheltered from a downpour by seeking refuge in the Chelmsford Public Library. Looking out at the clouds that gathered I realised that I would be there for sometime so I wandered around and eventually came across ‘The Essex Room.’ It was about the size of a large wardrobe and contained a goodly number of Essex-related books. I borrowed some scrap paper and a pencil from the Librarian, who did not seem keen to trust me with a pen, and began searching for information about the village in which I was raised, namely Langford in Essex. Amongst the data I culled from old Essex trade directories were scraps of information about the village pub, The White Hart. Langford is today (and forever has been) a village of no more than 230 souls. It nestles astride the River Blackwater and the ‘Long Ford’ from which its name is derived can still be discerned beside the concrete road bridge constructed in 1922. A few yards east of the river stands Mill Cottage. 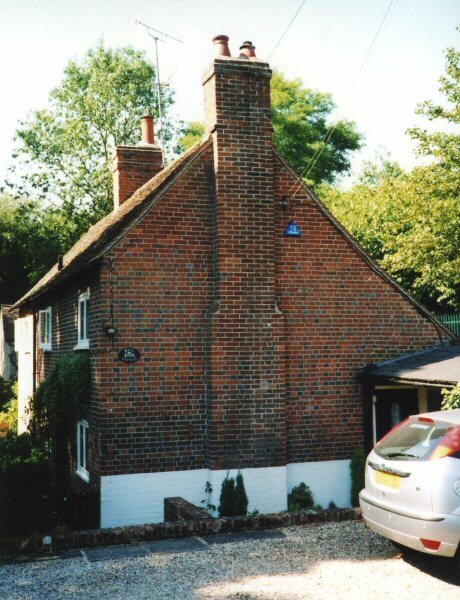 Mill Cottage, which stands at the junction of Hatfield Road (the B1019) and what is known locally as ‘the golf course road’, was in a previous life the White Hart. The pub name dates back to 1400 and is representative of the badge of Richard II (1377-1399), and even today remains one of the most popular pub names. 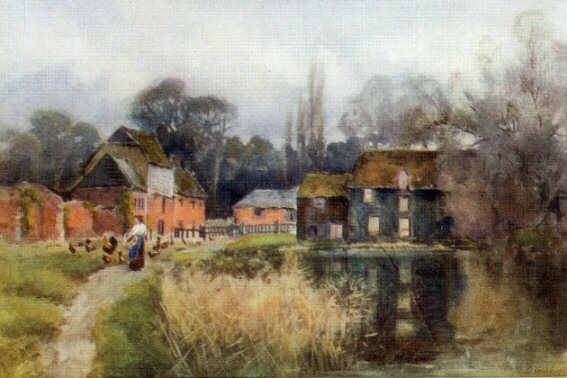 No record can be found that describes the structure of the White Hart but a painting by L. Burleigh Bruhl dated 1909 depicts the line of buildings on the left of the picture (reproduced here) as being of red brick construction with tiled roofs. The White Hart formed part of that building and served the population of the village and the employees of the nearby mill and doubtless slaked the thirst of the numerous agricultural workers taking a break from their labours during harvest time. The earliest published reference to the pub (1832) is merely the extent of the information that the available directories record, although the date does tie in very nicely with the introduction of the 1830 Beer Act, that marvellous piece of legislation which allowed ordinary folk to sell beer once they had purchased a license for a couple of pounds. My guess is that an alehouse of some kind would have been found at the site much earlier. By 1845 Eavery was named in Pigot’s Directory for that year as a ‘Beer Retailer’ but by then Charles Goodey (sometimes spelt without an ‘e’) was trading at the ‘White Hart Inn.’ So Eavery had set up on his own elsewhere in the village; either that or White’s Directory had its facts wrong. (Eavery is known to have later taken up the license of the Flying Tinker in Ulting, about 1½ miles west of the White Hart.) The directories list Charles Goodey at the White Hart from 1845 to 1860, Elizabeth Goodey from 1861-1865 and Stanford Charles Goodey from 1866 until the early 1870s. After 1873 there were no further entries for the White Hart. Langford has been ‘dry’ for over 130 years. Subsequent research indicates that the earlier Stubbings/Chaplin theory about the Byrons no longer holds water. Although no primary source material has (yet) been found to confirm the theory that when the Byron’s came to Langford, they shut the pub and sent Goodey to ‘Turners’, a sort of alms house in the village, one of the arguments against the theory is that the Byron family first came to the village in 1851, when Mary Jane Wescomb (one of the daughters of the estate holder Nicholas Wescomb) married the Hon. Frederick Byron and they moved in to the local mansion house, Langford Grove (not Langford Hall). The 1851 date does not tally and with the Goodey’s continuing in business into the 1870s, the ‘strict Methodist’ theory seems to be threatened. Another rumour related to the pub being closed because of the unruliness of the Irish labourers employed on the railway; a branch line constructed to link the main London to Norwich line town of Witham to Maldon which lies on a hill overlooking the Blackwater estuary and at that time a key port. If this was so, then the navvies must have stayed around for quite some time as the railway was completed in 1848! But the navvies did return…eventually. Mentioned in the Domesday Book, with its sheep, cows, villeins, a mill and a plough or two, Langford remained a sleepy rural village on the River Blackwater, with and without its pub, until in the mid-1920s until the Southend Waterworks Company obtained the Government’s approval (and that of the Byron family) to extract and treat water from the River Blackwater. This involved the construction of a huge pumping station in the centre of the village and a treatment plant near the western boundary of the village about a mile distant. The building work brought in hundreds of Irish navvies, all of whom worked all the hours the good Lord gave, plus a few, and all of whom were (presumably) in search of drink to wash the dust from their throats at the end of every tortuous day. So the labourers had to travel by foot or cart or whatever to the nearest watering hole, the Half Moon in The Square, Heybridge, 1½ miles east of Langford. The Anchor was a few yards further on and the Queen’s Head, the Maltsters Arms and the Wave around the corner in The Street. Stories of the rowdy labourers coming home on a Saturday night from an evening’s imbibing abounded in the village for many years and some say that on a quiet summer’s night if you cup your hands to your ears and listen you can still hear the raucous singing of the boys coming home from Heybridge – either that or it’s the sound of juggernauts thundering through the village. As a young lad growing up in Langford I chose not to frequent the public houses of Heybridge. My ‘local’ was the Sportsman’s Arms, Nounsley about three miles away. I have my older brother Michael to thank for that. He knew that, at 16, I could get served there. Today Langford remains publess. There was a rumour a while back that Mill House, a bed & breakfast establishment next to the village church of St. Giles’s and a few yards up the road from Mill Cottage, had applied for a licence that extended alcoholic sales to non-residents, an action that would have brought the licensed trade back into the village for the first time in well over a century. Nothing further has been heard and thus Langford remains pub-free. This makes me wonder if Langford has been dry for a longer period of time than any other village. Can anyone beat 141 years? Note: Both the Half Moon and the Anchor pubs in Heybridge are, at the time of writing, Indian restaurants. Currently the Sportsman’s Arms, Nounsley lies derelict awaiting either saving by the local community or demolition. Author’s note: The history of the White Hart is also featured in Irene Allen and Patrick Chaplin’s 500-page, lavishly illustrated history of the village Langford: An Obscure Essex Village Transformed published in June 2014 by Allen-Chaplin Publications. £15.00.